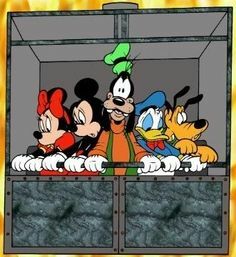 On July 17, 1955, Disneyland in Anaheim California opened its doors to a crowd of anxious people ready to explore the wonders of this new land! The park has been through a whirlwind of changes over the past 63 years. It’s such a historic place and Disney lovers like myself enjoy the nostalgia of it all. I’m hoping to make it out there next year for the D23 Expo and will absolutely spend a few days enjoying all Disneyland has to offer! Keeping it old-school in memory of all that Disney has brought us over the years, I’m leaving you with a happy birthday wish from the first Disney princess ever! Mickey’s New Look at Disneyland! Mickey Mouse is strutting his stuff and looking newer and fresher with an updated appearance that was revealed at the end of Disneyland’s 60th Diamond Celebration! Check out that fresh face and big, animated eyes! I love it! At Inside the Magic’s page, they have a great clip of the “new” Mickey Mouse as he trots down Main Street and meets with his adoring fans. Check it out below. I wonder if he will make the trip over to Disney World so that I can get a picture with him next time I get down to Florida. Or maybe I’ll just need to go back to Disneyland for trip #4 – no complaints there! Yesterday, I spent the afternoon shopping for the perfect tree to bring home, and relished in the nursery as they cut my tree, as I allowed the smell of pine and vanilla candles to fill me up! I just can’t wait to decorate it. Some might say that I purchased my lovely tree too early. Crazy, right? I mean, the folks at Disneyland began decorating their trees back on November 13th. No, really! Check out the video, I’m not making this up. Besides, tomorrow is December 1st, and the best way to kick off the most magical month of the year is by singing carols while trimming the tree! It was a surprise visit, completely last minute, but I went to Disneyland for the third time a couple of weeks ago… and it was AWESOME! I’m truly bumming about being back here, to be honest, I never wanted to leave! I saw all the wonderful events in honor of Disneyland’s 60th Diamond Anniversary. It was so beautiful. They were also beginning to decorate for Christmas, and I have never been to Disney during Christmas so it was really exciting! I only had two-full magical days there, but from open to close, this Diva was walking the parks! It was a fabulous time! Now, I have to plan a trip to WDW. It simply has to happen! Did you know that Doritos were actually invented in Disneyland? 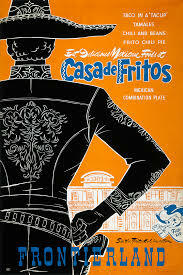 The Frito company ran a Mexican style restaurant in Disneyland on New Orleans Street called Casa de Fritos. Apparently, the marketing executive had the idea to fry them up and serve them as chips. Doritos means “little golden things” in Spanish. If my sources are correct, this is one interesting bit of snacking history, as well! You can check out the interesting story here!